Today I had the pleasure of hosting the @TeachForAmerica School Systems Leader Fellows. One would think it would be intimidating to have such a wealth of knowledge come and visit the school. On the contrary, all of them were very open minded and eager to learn from us. They asked specific questions and gave me and the staff great feedback. I learned several things during the visit, not only about what we are doing at GBMS, but what we are trying to do throughout the country in educating all of our kids. No Magic Bullet: There is no magic bullet that will make the changes happen. It takes a team of people to come together to define a problem, develop solutions and implement a plan. This is something that not only takes a leader but everyone in the school, district and community to make happen. Smarts: It does not matter what title you might hold in life, all of us should share our best ideas and continue to work together to solve the most complex problem in meeting the individual needs of so many students, especially when are taking about students with opportunity gaps. Ask for advice: When I looked at the backgrounds of the individuals visiting my school – http://www.onedayallkids.org/alumni-profiles/sslf-fellows, the only thing I requested was feedback from them on what I can do to make the school even better. How often do we have educators, from all over the country leading districts, enter our buildings and give us feedback? Guess what…the valuable feedback they provided are my action items for next year. Also, the positive comments gave all of my teachers and students an extra spring in their step. Sharing Ideas: I was excited to hear schools throughout the country are making positive changes and are looking at our model to implement in their schools. I was even given an opportunity to meet a principal in Washington DC that I look forward to connecting with to learn how he is developing his blended learning model. Sharing ideas and encouraging each other to think out of the box is so critical in the growing process. We do need to be aware, however, that a system of competition has been created amongst us and we, as leaders, need to continually remind each other to challenge that system to further collaborate to best help all students learn. “I would love my child to learn this way”: The ultimate compliment is when an educator walks into your building and wants their child to attend your school or wants their child to learn from the same format. If we are getting our kids ready for the next level, they need to be prepared for the rigors, by always being engaged in their learning, to be successful. Today I learned a great deal from the visit. The feedback was like an audit we should all experience. Districts should transform their current evaluation models to a model of feedback sessions. This, along with resources, would give our teachers and principals opportunities to be successful. This would create a culture of networking and sharing which would eventually support more kids. 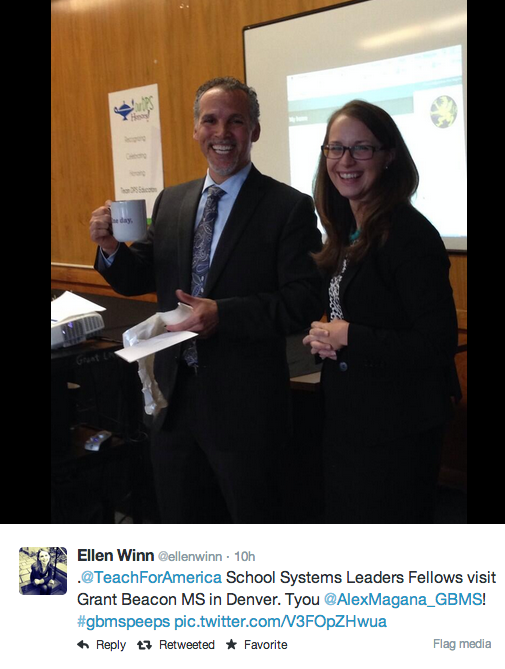 Thanks @Teacher For America School System Leader Fellows for visiting GBMS. I hope you learned as much from us as we learned from you. What is the one take away from this presentation that you will leave with? What is one thing that Grant can improve upon with our Blended Learning implementation? Please leave any additional comments or questions in the space below. Done well, blended learning can look very different from the Rocketship schools “warehouse ” model. It was nice to see a mix of models that promote collaboration and individual work rather than just kids on devices interacting in a limited fashion. Clarity of alignment between objective, instruction, outcome, and assessment. Some rooms were drifting into a slight activity driven pedagogy which is easy to do in a blended or CCSS implementing environment. Thank you for hosting us. Super impressive use of blended learning strategy! I know you all are working on it but I think collaboration in the blended learning classroom is a place for growth. Thanks so much! This was a great school visit. So impressed with how engaged students are with their own learning and what ownership they are taking. Not an improvement but rather a question about how students who are behind academically are getting the supports they need via Blended Learning? So impressed with your school! Teachers, students, principal, coaches — ALL focused on student learning. I visit many schools and this is rare to see. Love the engagement of the students and the strong sense of community in the hallways. I would have loved to see more support for students struggling with concepts. There was one class where a student didn’t respond to any of the math questions during the mad minute. Thank you! This was a great overall experience. The student ambassadors were friendly and engaging. Teachers were all welcoming and warm. It was incredible to see the depth of planning and team that is and was required to get the program off the ground. Continue working with teachers on the importance of posting the essential questions and goals. That aspect of the vision was not evident in all the classrooms I observed. The classrooms that had the information posted were extremely focused. Wonderful school culture. I’ve always know that culture is something that you feel once you walk into a building and this school has a gentle, caring, whatever it takes type of culture. Thanks you for having us. Every classroom had common practices around the Driving Questions, CLO, Agenda expectations, and Measurement. Ensure teachers periodically have checks for understanding as well as protocols for how to work the room to provide support. Great positive school culture. The mission and vision are clearly evident throughout the school. There is an awesome way to engage children in your school and I can see how blended learning can ignite this level of engagement in all schools I interact with–thank you! I am curious about two things:How is rigor monitored in the development of teaching and learning?How are lessons aligned to the common core standards? Thank you for opening your amazing school. You are unlocking the potential for so many great young people! I thought the concept of digits citizenship was interesting and it made me want to learn more about the content of that course I didn’t see evidence of students working together very much, which I would have liked to see in the blended learning setting. I’m curious whether students get opportunities to work together. The student leaders program was very interesting, I was very impressed with the students! Teachers are given the time to learn. I was impressed by how a teacher was able to clealry articulate what his learning goal was. I am still in the learning phase. Thank you forallowing us to visit. From the whole time today, I’m taking away the importance of deep and true respect for teachers in implementing large-scale school level change. I’m so impressed by the level of pride teachers take in being here and in their own individual roles and leadership. Every teacher I talked to told me what they were working to grow in. That commitment to learning modeled by teachers is so powerful and in my experience unique. I really don’t know enough to make a helpful suggestion here. It seems to be going very well! Thank you so much for welcoming us into your community today. We are so grateful! Everyone is invested in the process from the students to the administrators. Engaging all students during the regular classroom instruction. From time to time we noticed that a very small amount of students were not attending to their work. It may have been that the student did not ubpnderstand the content. What is your printed policy for the student’s personal tech devices? Devices are the last piece of the puzzle – first need a learning management system and to work with the teachers on string, general lesson planning. In one class we observed, the teacher was identifying additional instructions or other clarifications that were needed based on what he identified from individual time with students. How he delivered this, though, was to announce it out loud in the class as he identified it. I wonder if adding these to the Prometheus board or as pop up messages for students would be a more effective way to deliver this, as then students could access the directions on their own time and also not miss them because they’re engrossed in the work they’re doing. Thanks so much for having us and being comfortable with us talking to individual students during class periods! Really appreciated the honesty- the advice not to jump into BL/tech right away and the “first things first” (like teacher lesson planning). also really appreciated having the perspective of students and the roles that students played throughout the day. Clearly this is a school where student voice matters and things aren’t done TO kids but WITH kids. I’m curious about classroom alignment on aspects of management and instruction like objectives (not something that was clear in each classroom) and class or individual goals (not all students were able to articulate what they were working on and why) Thank you so much for hosting us! This was such a thoughtfully planned visit and you were so generous in your time and resources. Im reflecting on what is required that is different for good teaching in a blended learning environment. It seems like it demands teachers to be strong planners and users if data, stronger than what potentially traditional classroom teachers are required to be able to do. It also requires teachers to interact differently with students. Im wondering about how we distill snd coach teachers for this and it is encouragin that gbMS is working on this. Sometimes i did see what looked like just substitution, but I had a limited view into what was happening in the classrooms, so this may not be accurate. Thank you so much! Fantastic work happening at all levels. I am grateful that we were able to see how the students engage with their classroom materials as well as with their grades and tracked progress. I am curious about the spelling and math skills that the students learn outside of the tech space. Ensuring that technology remains a tool and not a crutch is critical for higher education. Thank you for providing the space and time to teach our group about how GBMS is using Blended Learning. The culture is positive supportive. Every single kid could explain what they were supposed to be doing and learning. I am impressed with teacher capacity around technology. I don’t know how to do many of the things your teachers have to do to complete those models or make those math videos. I saw high evidence of students engaged in independent learning. I am really curious to see the teacher student personal interactions and that daily feedback that kids could get in the moment as teacher walked around or had them hold up whiteboards. I just want to know the frequency and detail of the feedback the students get from the teacher on a daily basis. When I asked kids to show me feedback the examples I saw just said “satisfactory”. So I’m wondering what a kid does with that to improve. Thank you. I have a blended learning school in DC and this was great for me to see what it should look like and how it can be structured. I have some great discussion points to now have with my principal. Some resources I would like areGuidelines: what does an effective blended learning classroom look like and what are the instructional practices I should see in there?Blended learning coach job descriptionWhat does the blended learning coaching look like on a daily basis with teachers? What would you do in a session. I have a coach next year but not sure how it most effectively use him. Next 4 things to do when attending a conference with your Peeps! Online courses don’t mean personalized learning. Why not replicate a public school? 6 Ways to Start Curiosity Hour in your school.